The problem: Whom can you trust? What does this guide provide? Pi-hole includes a caching and forwarding DNS server, now known as FTLDNS. After applying the blocking lists, it forwards requests made by the clients to configured upstream DNS server(s). However, as has been mentioned by several users in the past, this leads to some privacy concerns as it ultimately raises the question: Whom can you trust? Recently, more and more small (and not so small) DNS upstream providers have appeared on the market, advertising free and private DNS service, but how can you know that they keep their promises? Right, you can't. When you operate your own (tiny) recursive DNS server, then the likeliness of getting affected by such an attack is greatly reduced. The first distinction we have to be aware of is whether a DNS server is authoritative or not. If I'm the authoritative server for, e.g., pi-hole.net, then I know which IP is the correct answer for a query. Recursive name servers, in contrast, resolve any query they receive by consulting the servers authoritative for this query by traversing the domain. Example: We want to resolve pi-hole.net. On behalf of the client, the recursive DNS server will traverse the path of the domain across the Internet to deliver the answer to the question. 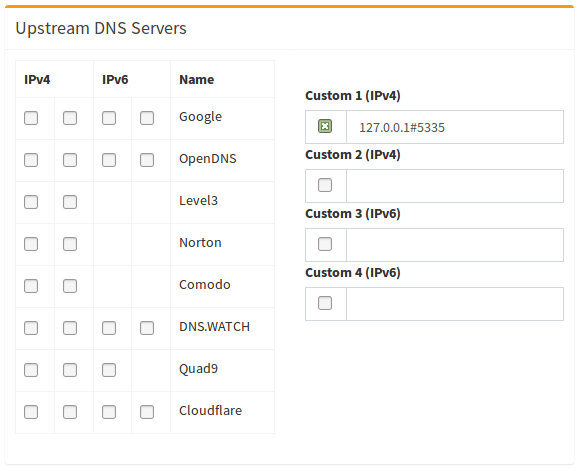 In only a few simple steps, we will describe how to set up your own recursive DNS server. It will run on the same device you're already using for your Pi-hole. There are no additional hardware requirements. This guide assumes a fairly recent Debian/Ubuntu based system and will use the maintainer provided packages for installation to make it an incredibly simple process. It assumes only very basic knowledge of how DNS works. Your client asks the Pi-hole Who is pi-hole.net? Your Pi-hole will check its cache and reply if the answer is already known. Your Pi-hole will check the blocking lists and reply if the domain is blocked. Since neither 2. nor 3. is true in our example, the Pi-hole forwards the request to the configured external upstream DNS server(s). Upon receiving the answer, your Pi-hole will reply to your client and tell it the answer of its request. Lastly, your Pi-hole will save the answer in its cache to be able to respond faster if any of your clients queries the same domain again. Since neither 2. nor 3. is true in our example, the Pi-hole delegates the request to the (local) recursive DNS resolver. Your recursive server will send a query to the DNS root servers: "Who is handling .net?" The root server answers with a referral to the TLD servers for .net. Your recursive server will send a query to one of the TLD DNS servers for .net: "Who is handling pi-hole.net?" The TLD server answers with a referral to the authoritative name servers for pi-hole.net. Your recursive server will send a query to the authoritative name servers: "What is the IP of pi-hole.net?" The authoritative server will answer with the IP address of the domain pi-hole.net. Your recursive server will send the reply to your Pi-hole which will, in turn, reply to your client and tell it the answer of its request. Benefit: Privacy - as you're directly contacting the responsive servers, no server can fully log the exact paths you're going, as e.g. the Google DNS servers will only be asked if you want to visit a Google website, but not if you visit the website of your favorite newspaper, etc. Drawback: Traversing the path may be slow, especially for the first time you visit a website - while the bigger DNS providers always have answers for commonly used domains in their cache, you will have to transverse the path if you visit a page for the first time time. A first request to a formerly unknown TLD may take up to a second (or even more if you're also using DNSSEC). Subsequent requests to domains under the same TLD usually complete in < 0.1s. Fortunately, both your Pi-hole as well as your recursive server will be configured for efficient caching to minimize the number of queries that will actually have to be performed. Important: Download the current root hints file (the list of primary root servers which are serving the domain "." - the root domain). Update it roughly every six months. Note that this file changes infrequently. The first query may be quite slow, but subsequent queries, also to other domains under the same TLD, should be fairly quick. The first command should give a status report of SERVFAIL and no IP address. The second should give NOERROR plus an IP address.